I crack up every time I see this meme pic. 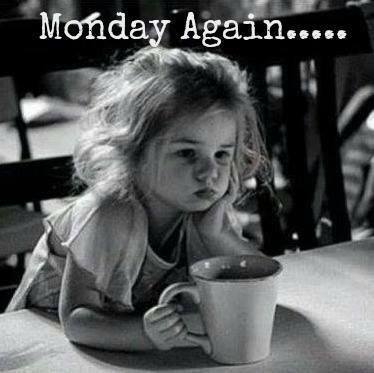 This is so me most mornings but especially Monday. Sunday was Put the House Back to Normal Day. Dining room is winter-going-on-spring now, with Christmas packed away. We use our “front” room as the dining room since turning the dining room into the library. The fireplace is in the front room but we never used it because there wasn’t enough room for seating. Works great as a dining room though. That said, the big wreath and stockings get hung on the mantel there. The outside decorations are down and packed away, but I liked having ambient light on the porch so I strung a string a 100 blue LEDs. Was cool last night. Of course, Nessie is still lit up. We keep him lit up year-round. Prevents people of trying to steal his head. I did NOT get the Christmas tree down. It’s in a corner and out of the way so it’s good for now. So, that’s pretty much life at the moment. What’s going on in your worlds? This entry was posted in Writing Life and tagged books, follow up, lolpic, Monday, OKRWA, reading, TV, writing. Bookmark the permalink. I’m sorry you’re so frazzled. :hugs: It’s early yet – you’ll get back on track for your goal. And things will fall into place. I’m in some sort of timewarp, flux-continuum thingie. I woke absolutely positive it was Friday. I’m still trying to shake that. “Monday Monday, can’t trust that day.” I got the edit notes entered for IDW. Now I have until next Sunday to read-through and make whatever changes I need before I shoot it back to J for a final edit pass. While she’s doing that, I have Up Wish Creek loaded on my Kindle so I can read it again and figure out what needs doing on that. Plus, I have my own edit notes to enter for Fertile Ground so I can shoot that to J when she finishes with IDW. Oh, and I put everything on sale in my Kindle store. Until the end of the month, most likely. Have to generate sales from somewhere. Weeee. Jeez, I hear you on the sales. Mine have tanked for going on the 3rd month now. And KEPN payout is down as well. I need to get something new out, like ASAP but nothing is jumping up and down for me. That means I need to pick a project, put my put in my chair and just write the damn thing. *sigh* It’s a job, right? A creative job, but still a job.